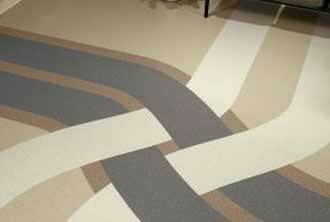 Infinium Floors is a comprehensive, full service commercial flooring design and installation dealer. We offer procurement, installation, and project management for a variety of flooring solutions for your project specific needs. We will collaborate with you to find the appropriate flooring products at the best price point to fit your project and your budget. We routinely work closely with architects, designers, contractors, and end users that seek turnkey solutions for large and small projects alike. Partnering with the leading manufacturers in the industry, we are able to provide high quality commercial flooring systems for most any commercial environments. Explore our flooring options found below. 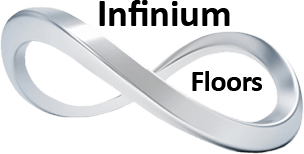 Infinium Floors - serving our clients with innovative design, quality, and value while exceeding your expectations. 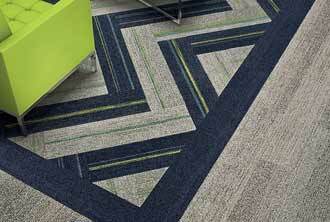 Our commercial carpet and carpet tile is much more than a collection of flooring products. It is a comprehensive program built specifically to provide customers the right flooring solutions for any end use application. 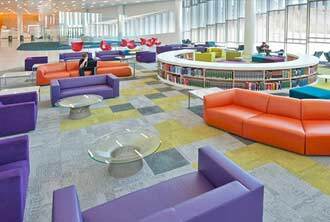 From department stores to libraries, high schools to media rooms, Infinium Floors' solid portfolio of stylish carpet is designed to beautifully complement every setting with the perfect mix of fresh style and premium long-lasting durability. Our carpet partners such as Mohawk, Milliken, Tandus, and Shaw. 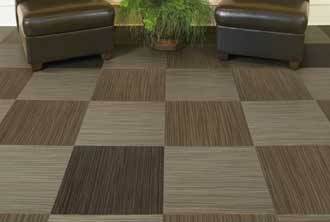 Their carpeting consistently delivers top performance, superior sustainability, winning value, and unmatched service. Our collection of Luxury Vinyl Tile (LVT) captures the essence of earth's woods, stones, metals and original graphic designs in a wide array of tile and plank sizes. Our commercial LVT combines the best of durability, technology, and design to give you the look and performance you expect. 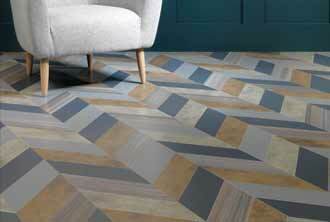 Mohawk, Armstrong, Johnsonite, Mannington, and Amtico are the top LVT brands and Infinium is proud to offer them. Beautiful yet intelligent are the essence of broadloom carpets. Infinium Floors has partnered with such renowned manufacturer as Mannington and Mohawk to offer these high quality, high performance carpets. Recently, these broadloom carpets have undergone a design makeover. 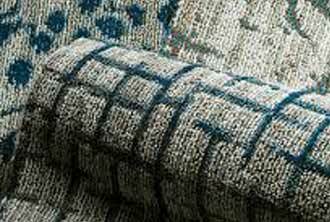 From classic fashion to contemporary design, it's time to start believing in broadloom again. Our commercial broadloom carpets offer a timeless look that have been updated, alongside unexpected patterns and colors, to satisfy any design needs. Bringing fabulous broadloom to commercial interiors projects, hand in hand with coordinating products from our comprehensive hard and soft floor coverings is what we do at Infinium. We have broadloom carpeting for every budget. Our VCT flooring come in colors that are designer-oriented with a wide variety of composition color options, tile patterns and styles coordinate specifically for commercial applications. The popular Azrock vinyl tile from Johnsonite is also a good option for retail businesses and is designed to withstand high foot traffic areas. 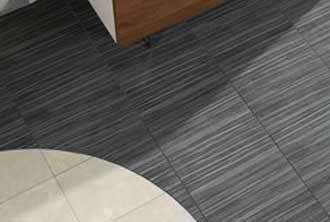 What is Vinyl Composition Tile? No matter how widely varied their approach to commercial spaces, contemporary interior designers all share an affinity for porcelain tile's look, durability, moisture resistance, and low maintenance requirements. Also, porcelain can be expected to last longer than ceramic in almost any application. Infinium Floors' portfolio of premium porcelain tile resonates the American design aesthetic for corporate, health care, hospitality or retail applications. 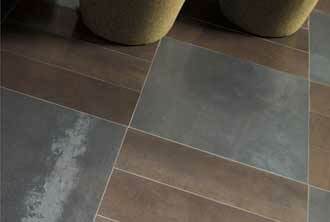 Our Crossville, Daltile, and American Olean lines set porcelain flooring industry standards, and then exceed them. These manufacturers are pioneers in earth-friendly products and manufacturing practices. From award-winning porcelain stone and glass mosaics to metal accents, our team of commercial porcelain tile experts looks forward to working with you on your commercial tile project. 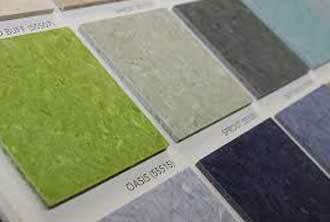 Sheet vinyl flooring is known for its versatile array of designs to easily match any decor. Sheet vinyl is even available in wood, stone, ceramic, and slate visuals. It's easy to install and easy to keep clean, saving in time, money and disruptions. With a rich and authentic quality, our Johnsonite and Armstrong lines feature new patterns that will enhance any floor to harmonize the warmth and sophistication in any commercial space. Johnsonite’s iQ Natural is a major advancement in a commercial vinyl sheet flooring that combines beauty, high performance and sustainability. iQ Natural uses a revolutionary plasticizer based on renewable resources that increase the product’s natural content to 75%, making it a more earth-friendly flooring solution. 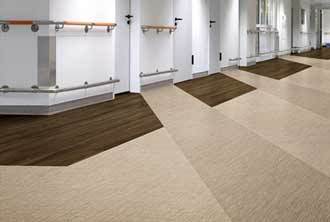 This flooring solution offers options for any application - from healthcare to education, offices and retail. Our new rubber tile collection from Mannington and Johnsonite has something for everyone and every style. 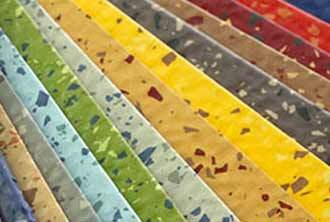 A rich new array of colors, patterns and textures includes marbleized and speckled patterns. Solids in a myriad of colors and textures. A multitude of shapes with unlimited custom colors. 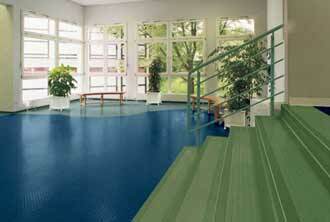 Rubber flooring is naturally slip resistant, often an important consideration in flooring for stairs. It has shock absorbing qualities and natural acoustic properties. 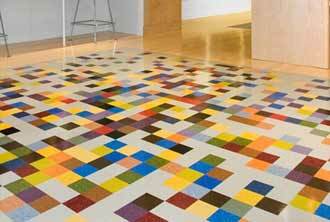 Infinium Floors can provide Our ColorScape™ and ColorSpec™ floor tiles made with a better rubber formulation. Shaped by Mannington to hold their amazing color, resist indentations and cracking, and be quiet underfoot. Profile patterns that are both practical and lovely make them easy to clean, and ensure that they remain slip resistant for years. Built-in waxes produce a natural luster that requires no finishes or stripping, lowering maintenance costs. 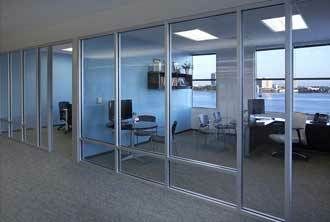 Superior quality and durability will give peace of mind in specifying this product. 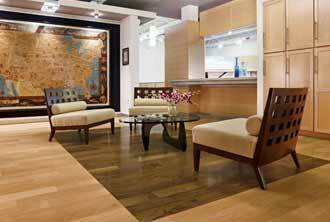 Hardwood flooring for commercial spaces has never been more popular. Hardwood brings an elegant, sensual appeal to any interior. Our Armstrong collection of beautiful hardwoods is intended to meet the high design needs and the traffic demands of retail stores, hospitality areas, educational institutions, office environments, and more. What makes hardwood floors unique? Wood is a natural material that reacts to light exposure. 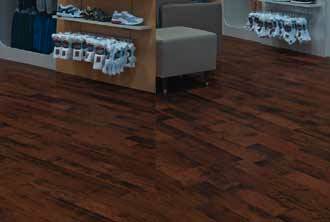 Exotic hardwoods gain richness in color and may become darker or lighter over time. The most dramatic change will occur within the first six months following installation. Industries Served: Commercial, medical, education, healthcare, assisted living, medical office, property managers, general contractors, corporate, office, retail, apartments, multi family, commercial real estate developers, property management firms, interior designers, contractors, landlords, individual business owners.